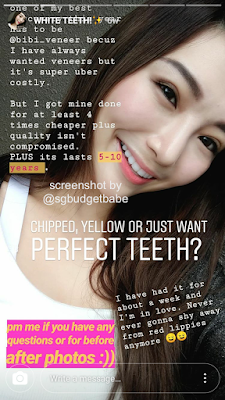 SG Budget Babe: Are these dental veneers for whiter teeth that's being promoted by Instagram influencers really safe? 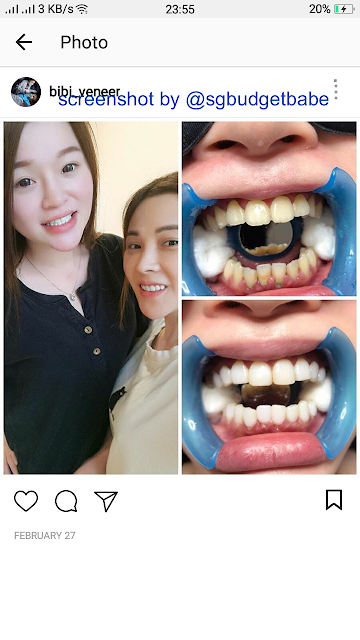 Are these dental veneers for whiter teeth that's being promoted by Instagram influencers really safe? How do you know if your dentist is licensed to provide dental services in Singapore? I usually look out for their practising certificate and professional qualifications. If those are not available and I'm in doubt, I do a quick check on the Singapore Dental Council's public database here. 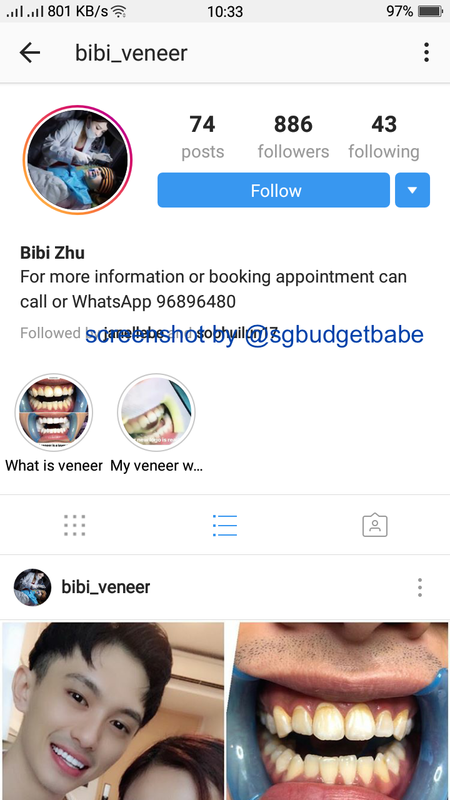 Recently dental veneers administered by a Bibi Zhu caught my attention after I saw it being promoted by various influencers here in Singapore on Instagram. As I mentioned previously, I avoided the Beautiful Teeth Whitening Kit like the plague when it went viral (also largely because various influencers were promoting it), as I suspected that it contained an exceedingly high level of hydrogen peroxide in order to achieve that sort of whitening effect and believed that could only be supplied through registered dentists instead of a DIY kit made and sourced from China. 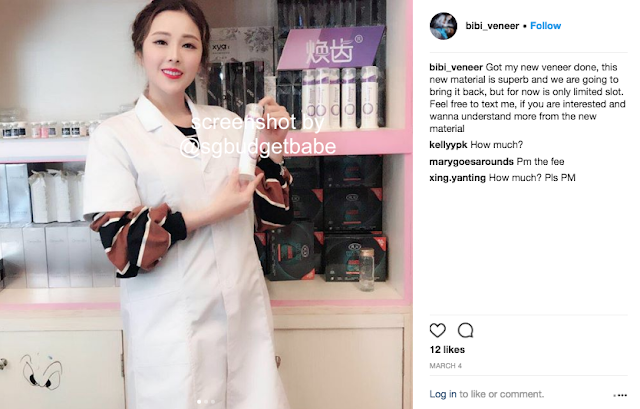 Yet at that time, some of the influencers who were promoting and selling it claimed that it did not contain hydrogen peroxide at all, and you can read about my original suspicions here. Well, a month later I was proven right, and HSA officially came out with a statement containing exactly what I had suspected was wrong with the kit. But by then it was a little too late, as many of my friends around me had fallen prey to the marketing gimmick and had already used it. 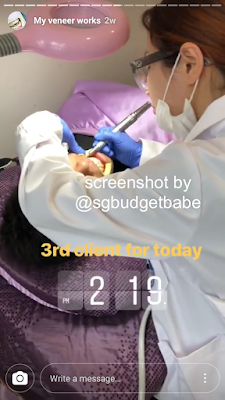 Now, I'm not too sure if any of these influencers had done their due diligence prior to doing their procedures, much less promoting it on their Instagram, but I decided to check out more details on my own before deciding whether to go for it. Veneers are generally thin pieces of porcelain that are molded to fit and attached to the front of your teeth. 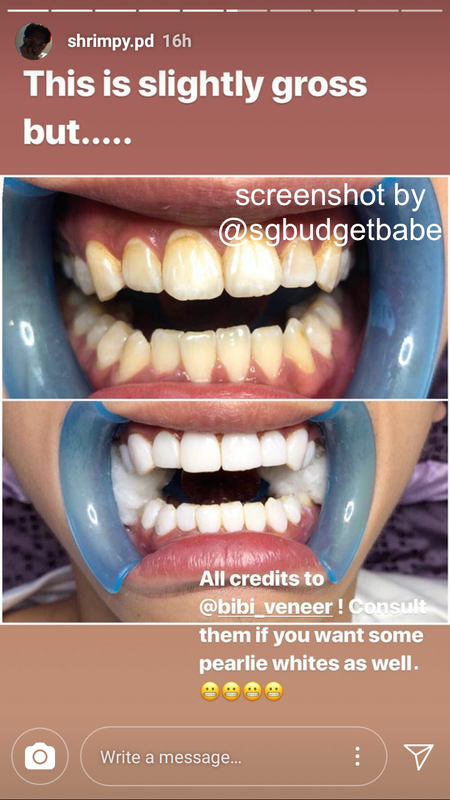 If you've ever wondered how your favourite Hollywood celebrities seem to have perfect white teeth all the time, there's a good chance they might have done veneers. The cost generally starts from $1000 and up for a veneer in Singapore, so if you need 6 veneers each for your upper and lower front teeth, you can prepare to fork out a 5-figure sum as an estimation. During the procedure, the teeth are disinfected and a composite cement is used to seal the teeth under the veneers. 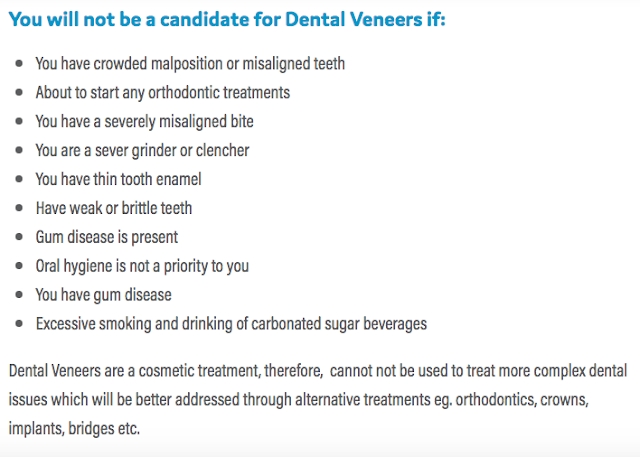 But while veneer might give you a perfect smile immediately after, it is not a procedure to cure the underlying dental problems, especially if your teeth is decayed or rotten. It can hide your problems, but that could lead to even worse problems down the road if proper dental treatment is not sought. 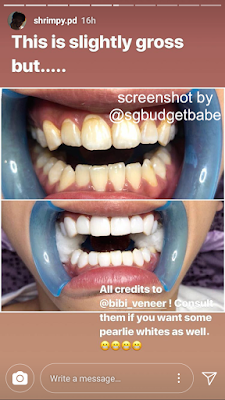 In extreme cases of botched procedures, the gaps between the veneers and the underlying tooth can also allow bacteria and decay to flourish, or if the dentist removes too much tooth enamel, the nerve could even become inflamed or infected that might just cause the tooth to fall off. Candidates with a history of weakened enamel, gum disease or any dental conditions are generally not suitable for veneers. But when I got a friend who works in the dental profession to take a look, she pointed out that the teeth in the customer's photo below look as though they might have other underlying dental issues that need treatment first, thus potentially making this customer an unsuitable candidate for veneers. 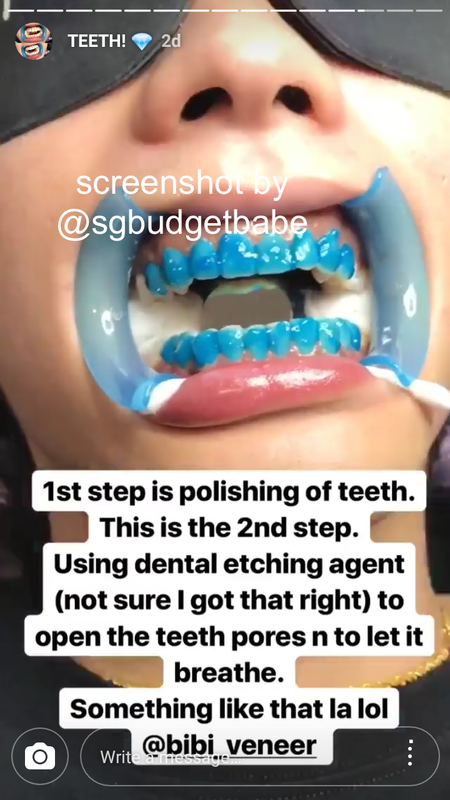 I cannot be sure on this though because I'm personally not a dentist, nor have I ever studied professional dentistry. However, what got me concerned is that this particular procedure is being carried out in what appears to be a home salon. 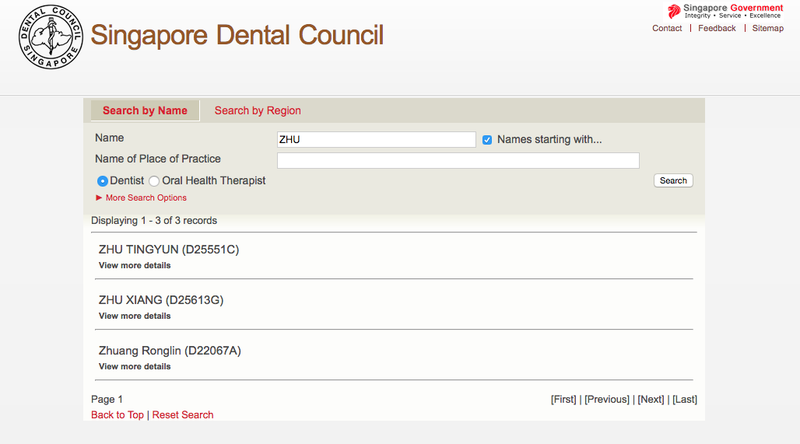 I was also not able to find out whether the person administering the treatment, Bibi Zhu, is licensed to provide dental services in the first place, as her name did not appear in SDC's database. Based on my research, she seems to be formerly from Xiamen. I got worried and then went to read up about Singapore's Dental Registration Act to find out if unlicensed dentists are in fact, allowed to practice here if they haven't been registered or approved by SDC. Based on Section 22 and 28, it seems as though this could be an offence if proven to be true. 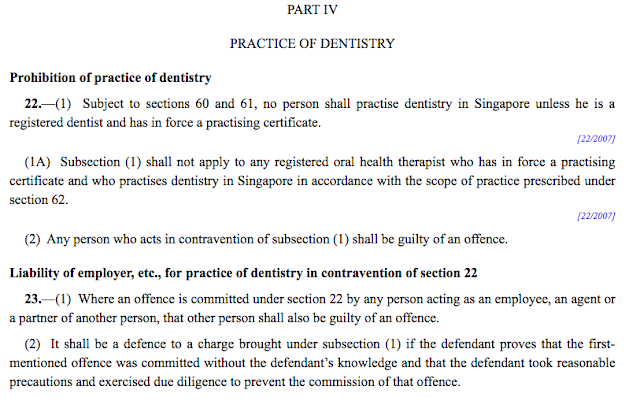 You may refer to the full Dental Registration Act here to understand the legislation governing dental practices in Singapore. All of these left me feeling greatly unsettled. A reader told me she had called SDC to check, but was told that it wasn't under their purview. Having no answers, I've also written into SDC and MOH and am now waiting for them to verify directly. 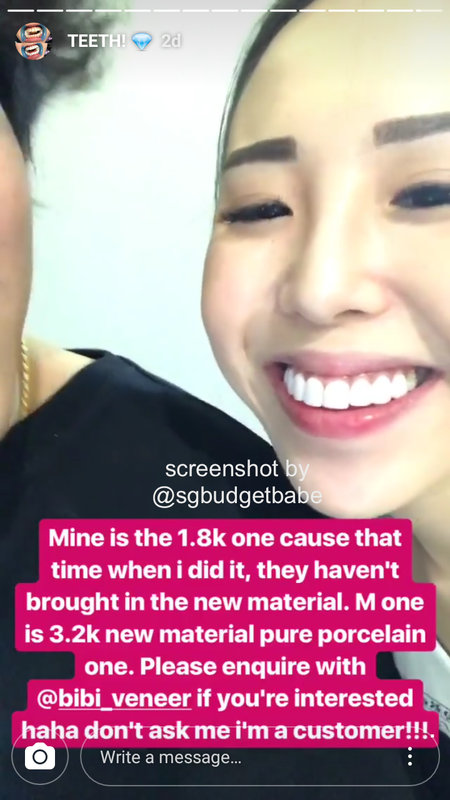 We've seen the aftermath of the Beautiful Teeth Whitening Kit previously, where the influencers who sold it made lots of money from the sales. Although it was later reported on CNA that sellers of the product could face a fine up to S$20,000, a jail term of up to 12 months, or both, it seems like nothing has happened to the influencers who sold it thus far, and neither did any of the ones whom I was aware of ended up in jail. 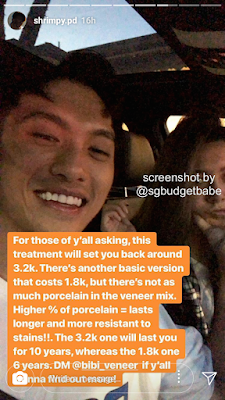 That kit cost $70, but this veneer procedure costs $1,800 / $3,200 (depending on which material you go for) and supposedly lasts for 7 - 10 years. It definitely seems far more dangerous and intrusive, and I'm not quite sure if I would entrust my teeth to the hands of a home dentist whose name I cannot find on SDC's register, whether or not the influencers are promoting it. The problem is, are there others who might have gotten influenced? I'll update once I receive a response from SDC or MOH. How does this topic relate to finance or budgeting or anything at all ? If you're trying to save money and go for this veneer procedure with this dentist because it's $8k to $12k cheaper, how is this not relevant?!? Also I write about personal finance. This includes making smart financial decisions on spending, instead of being penny wise pound foolish. Govt indiscriminate open leg policy brought in many illicit trades in recent years. They also sell chinese vigara. That is why Changi airport keep setting new records of arrivals in the news. How does it help he man on the street i am not sure? Hello! You're very right to say that any dental procedure should be administered by a dental professional as there may be underlying problems that are missed. Thanks for putting up this post!